I’ve been using my trusty chinese bamboo steamer on weekly basis to cook salmon, as with steam the texture and taste gets close to perfection. My new salmon staple has become a soy sauce – wasabi marinated butterflied fillet, and I really, really love the sharpness of wasabi with warm, fatty fish. After months of raving I managed to get Anna try this dish, and albeit she liked it, apparently her steamed teriyaki salmon was even better ;) Sucker to new recipes, I tried hers, and surely it was super yummylicious! This posting is not about steaming or fish. Enough of those already :) Since teriyaki salmon was so good, and the teriyaki sauce sooo easy to make from scratch, I decided to play around and make someting else. First I thought making chicken teriyaki, but I didn’t have chicken, but instead a pound of fat free super high grade ground beef left over from a steak tartar I made the day before. Mix soy sauce, mirin and sugar, and quickly warm in the microwave oven. Stir until sugar has dissolved. Mix shallots, raw potatoes, garlic and black pepper in a food processor until fine. Knead the mix together with the ground beef and 1/4 or slightly more of the teriyaki sauce. 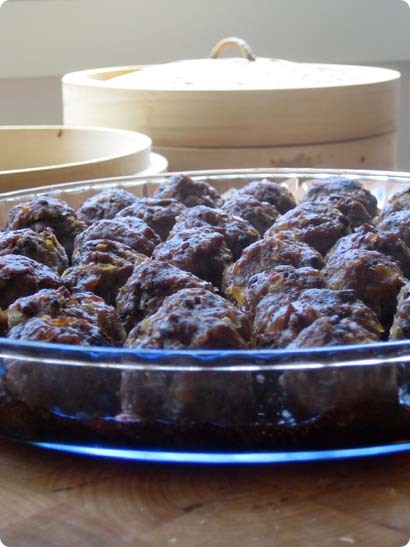 Make small meatballs, and place them onto a pan. Cook the rest of the teriyaki sauce with corn starch until quite thick, and pour over the meatballs. Bake for 30 minutes in 200 degrees celcius until nice and brown. Great to see you back Antti! Although I’m sorry to hear about your arm…hope you are feeling better! You did take your time, Antti! Glad to see you back, and I’m happy to hear that you’re feeding S well:) Teriyaki meatballs sound yummy! Now I have an itch to blog about steak tartar. Mmm, raawww. delicious! love teriyaki and never tried it out like this… till now. something to look forward to this weekend.